PATERSON, N.J. — G96 Products Inc., a leading supplier of gun lubricants and cleaning products, has introduced a new grease for rapid-fire weapons where smooth, glitch free operation can mean the difference between life and death. The new RFG (Rapid Fire Gun) Grease uses nano-synthetics to increase lubricity, even in extreme temperatures. RFG Grease, available in .42 fluid ounce (13cc) syringes, will maintain its integrity from –80 up to 500 degrees Fahrenheit. Unlike some brands’ gun grease, RFG Grease won’t “bleed out” oil during long-term storage. While RFG Grease delivers superior performance for all types of firearms, it earns its stripes in rapid-firing weapons. Reduced friction is essential for efficient, reliable operation. Along with its ability to protect against corrosion, RFG Grease will extend the life of any firearm. It is also safe for use on polymer weapons. “We’re confident that this is the best grease for automatic and semi-automatic weapons on the market,” says Alan Goldman, president and CEO of G96 Products. RFG Grease is 85 percent biodegradable. 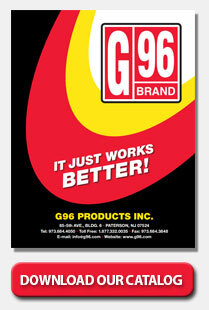 G96 Products Inc. is one of the most trusted names in gun lubricants and cleaning products. Used by shooters around the world, including many law enforcement agencies, G96 continually strives to live up to its reputation for providing world-class products for firearms. For more information, call 973-684-4050 or visit www.G96.com.